The costs of industrial agriculture are astonishing in terms of damage to the environment, human health, animal suffering, and social equity, and the situation demands that we expand our ecological imagination to meet this crisis. In response to growing dissatisfaction with the existing food system, farmers and consumers are creating alternate models of production and consumption that are both sustainable and equitable. 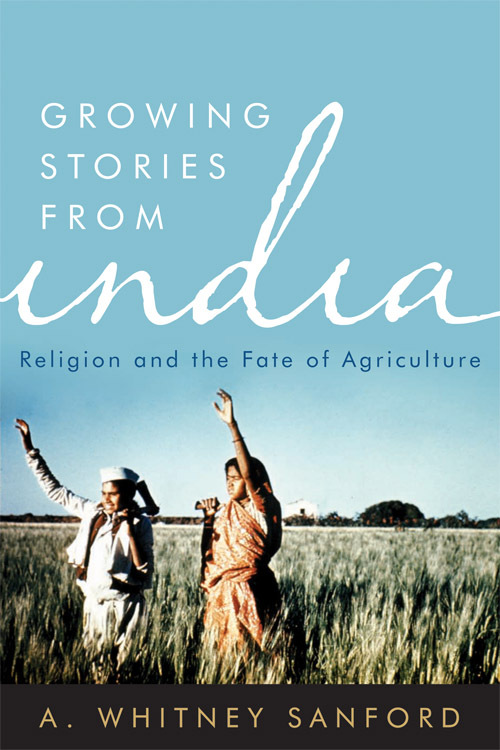 In Growing Stories from India: Religion and the Fate of Agriculture, author A. Whitney Sanford uses the story of the deity Balaram and the Yamuna River as a foundation for discussing the global food crisis and illustrating the Hindu origins of agrarian thought. By employing narrative as a means of assessing modern agriculture, Sanford encourages us to reconsider our relationship with the earth. Merely creating new stories is not enough—she asserts that each story must lead to changed practices. Growing Stories from India demonstrates that conventional agribusiness is only one of many options and engages the work of modern agrarian luminaries to explore how alternative agricultural methods can be implemented. A. Whitney Sanford, associate professor of religion at the University of Florida, is the author of Singing Krishna: Sound Becomes Sight in Paramānand’s Poetry. She lives in Gainesville, Florida.